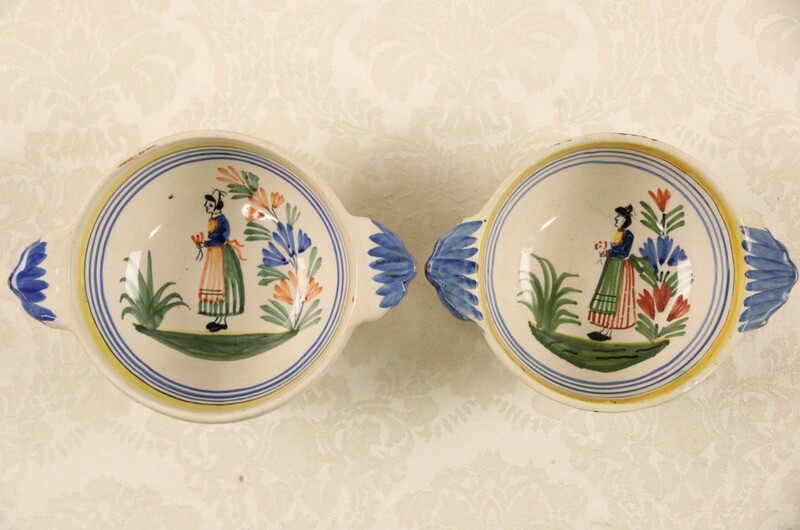 Signed "Henriot Quimper," this pair of porringers or bowls with handles was hand painted in Brittany, France. This pottery has chips at the edges, see photos. Size is 6 1/4" across, 5" diameter and 3" tall. See 14 photos on Harp Gallery website that enlarge to full screen size. USPS Shipping is $15 in the US. We are here to answer any questions, including shipping information and additional measurements. Please call us toll-free at 866-733-7115 or use this form. Copyright ©1998-2019 Harp Gallery Antique Furniture.